A hidden gem, the Sorolla Museum was the home of renowned Spanish Impressionist painter Joaquín Sorolla and his family. Donated to the government in 1929 by Sorolla's widow, the house now operates as a memorial and museum, displaying a large collection of Sorolla's glowing works and other contemporary collections including sculpture, ceramics, furniture and jewellery. A fine example of a bourgeois Madrid home from the early 20th century, the attractive museum has an intrinsically Spanish style with brightly painted walls and dark furniture. The little garden is also lovely. Much of the house remains as Sorolla left it, right down to his stained paintbrushes and pipes. 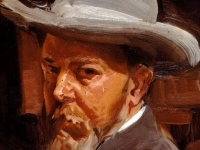 Although known for his portraits of aristocrats, Sorolla's passion lay in depicting the everyday lives of Spanish people, with many paintings depicting Spaniards in their native dress, going to the beach and engaging in work or leisure activities. Informative audio guides are available for an extra €2. Afternoon visits are recommended for those wanting to avoid crowds, as school and tour groups usually come in the morning. The museum is delightful, but small, and won't require much time to explore. Opening times: Tuesday to Saturday 9.30am to 8pm; Sunday 10am to 3pm; closed Mondays. Admission: €3 (general); €1.50 (reduced). Free admission Saturdays between 2pm and 8pm, and Sundays.